Over the last 8 years we have selected and developed many new plat cultivars. This is the page about them. Propagating plant from seeds, from a wide collection of perennials and ornamental grasses, can result over the years in a very interesting combination of characters which can give rise to new cultivars. Occasionally spontaneous mutations or sports can arise from existing cultivars or species. Propagating them and testing their stability can result in new interesting and unique varieties of plants. The plant originated as a variegated sport of our "Kalići's milky stipes" variety. It has creamy yellow leafs spotted by little green dots, more heavily in the center of the leaf. The plant is low growing forming an evergreen cushion. The leafs dont lose the coloration during the season and present the most intensive colors in the spring with the new flush of growth. This variety flowers with white flowers on short stalks in early spring. Height: 10 cm Spread: 50 cm or more. The plant originated as a variegated sport of "ice cups" variety. It has green leafs stricken irregularly by little creamy stirpes, frequently on the rims of the leaf. The plant is low growing forming an evergreen cushion. The leafs dont lose the coloration during the season and present the most intensive colors in the spring with the new flush of growth. This variety flowers with white flowers on short stalks in early spring. Height: 10 cm Spread: 50 cm or more. This artemisia originated as a variegated sport of the specie Artemisia vulgaris. The foliage is variegated in spring. When emerges the leaf borders are lightly tinged with yellow. The borders turn more green as the season progress. Very vigorous and tall plant with sturdy, upright stems. Deciduous. Height: 80 - 90 cm. Spread: indefinite. This Helenium autumnale seedling have big clusters of daisy like flowers. Golden yellow, wedge shaped rays at frst, turning to red orange shades as the flower becomes older. Old flowers have orange rays with yellow tipps. The central disck is lime green at first turning to red and maroon shades as the florets opens. Flowering from summer to autumn. Mid-sized variety. For moist, sunny positions. Height: 80 - 90 cm. Spread: 30 - 40 cm. 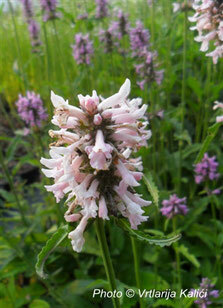 Lamium maculatum is a great perennial suitable for dry to moist shade having naturally variegated leaves. As the leaves matures they loose the central variegation and in the middle of the summer you can have a plain green plant. We wanted a plant with the same characteristics of the wild type but able to maintain the central variegation through the growing season. 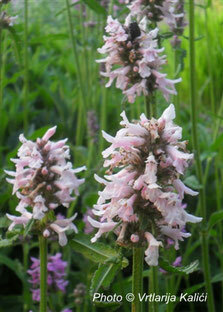 Lamium maculatum "Kalići's Select" is just like the wild type but "perennially variegated". The flowering is abundant and last for long. 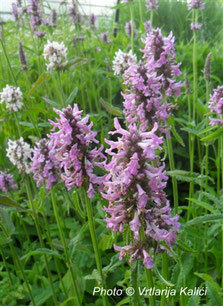 If you cut the plant to the ground after the first flowering you can have a new flush of flowers at the and of the summer. Height: 20 cm. Spread: to 40 - 50 cm. 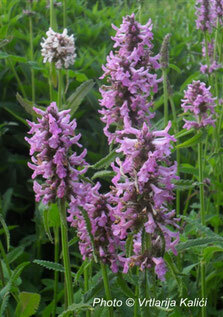 This selection originated as a seedling of Lavandula angustifolia. This is a low semi-shrub with small, evergreen, gray leaves. It has a rounded habitus and a compact growth. The flowers are born on long, arching stalks and are deep purple in color. The calyx of the flowers are intensive and rich in color just before the flowers opens in a lighter mauve color. Breed in very hot and dry climate so the plants are very suitable for Mediterranean and dry gardens. This variety originated as a seedling of Persicaria microcephala which is a true colorshifter. The new leaves emerge red purple in color with a large silvery mid-band. As the season moves on the border of the leaves turn to a solid green color with a large purple spot in the middle of the leaf. The stems of the plant are bright red. This variety is very tolerant of heat and humidity and grows well with low water levels in semishaded cpositions. Height: 80 - 90 cm. Spread: 20 - 30 cm. This vinca variety originated as a seedling we spotted in a corner of the nursery garden. The new shoots emerges in the spring of a solar golden color. The plant flowers with intense blue flowers. As the shoots mature during the growing season they turn more green but maintains a golden overlay on the leaves. Leaves are rather small compared to the wild Vinca minor and the whole plant is very low growing forming a dense evergreen mat. New stems are red. Good contrasting colors. Height: 5 cm. Spread: indefinite.